So I cheated. 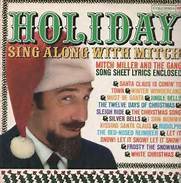 Next up should have been the first Paul McCartney solo album, but hey, how many people still have their parent’s old Mitch Miller Christmas album, and isn’t this appropriate? It is my chance to celebrate the holiday and says happy holidays to you. But this doesn’t so much bring back memories of Christmas for me, it reminds me of evenings sitting in the den (or the playroom as it was referred to in my house though my brother and I would soon take over much of the basement) with my brother watching television on a big old box of a black and white TV set. He’s been gone more than 28 years now, and I’ll never stop missing him and being grateful for the time we had together. Merry Christmas, Davey. Anyway, Max got catnip for Christmas, and I treated myself to a new set of multi-colored Pilot G-2 07 pens.